What material are wrought iron railings fences and gates made of? Do building codes require that I have a handrail (or fence)? Does Mind’s Eye paint or powder coat their wrought iron products? By default wrought iron products are painted with a very high quality enamel. However, we can have them powder coated for an additional charge. Projects that require on-site welding (ex. too big to transport in whole) will be damaged at the welded connections. This is unavoidable as powder coating cannot be done in the field (by anyone). The damage is, of course, touched up. But touch-up uses regular paint. Why are aluminum fences less expensive than wrought iron / steel fences? Aluminum fences are about 2/3 – 1/2 the cost of wrought iron. They were developed as an alternative to true welded wrought iron fences. Made in standard panel sizes, usually 6’, aluminum products are mass produced available in a finite number of design options. The panels are fastened to the posts by mechanical fasteners (i.e. screws) and are designed to be assembled without specialized tools or skills, namely a post-hole digger, hacksaw, and a screw driver. The lighter weight and standardized designs of aluminum fencing makes shipping from large-scale, centralized plants feasible. It has some drawbacks. First, to be cost effective it has to be easy to install. So, it uses mechanical fasteners. Because posts are hollow the threading for the screw can strip. This attribute is exacerbated by aluminum’s softer density. True wrought iron is welded at all steel-to-steel connections. The fabrication and welding processes requires highly specialized tools and skill set. The assembly is far more labor intensive than mass produced products. For example, a fence with 3/4" pickets requires 1-1/2 feet of welding for every one foot of fence or rail span (just for pickets). Unlike mechanical fasteners, welding quite literally converts two pieces into one. It liquefies the metal of both parts which “refreezes” when they cool. Like two ice cubes allowed to melt into puddles then refrozen together, they are one piece indistinguishable from one another. 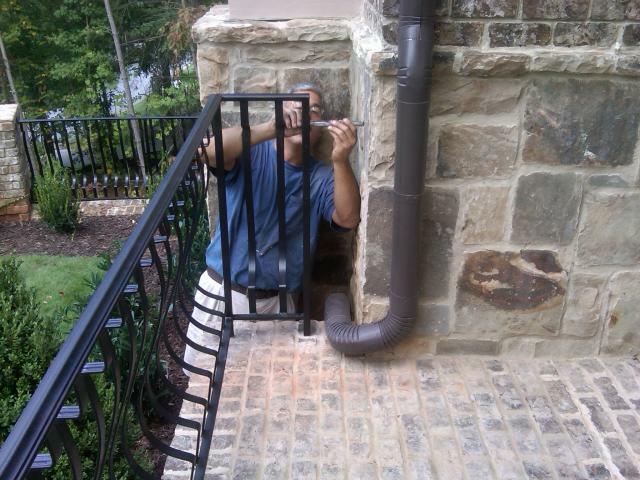 With that said, Mind’s Eye Fabrication is happy to install aluminum fencing for you. It may be perfect for your situation. We just want you to understand the differences so you can make an informed decision. Give us a call. We’ll help you choose the right product for you. How are wrought iron handrails attached to my front porch or deck? Mind’s Eye Fabrication core mounts wrought iron handrail posts when possible. Core mounting involves drilling out a hole large enough to accommodate the rail posts then anchoring the posts with cement. Core mounting can be done on most masonry surfaces and substrates and is not possible for wood surfaces. Alternatively, posts can be surface mounted using screws and shoes or base plates. Surface mounting is necessary and acceptable for wood substrates (wood deck or wood porch, etc.). Surface mounting is not recommended for masonry applications. How does the process work for getting my wrought iron rails (or fence, or gate)? What I need to do? First, we need to talk about your project. What are you looking for? What do you want to accomplish (ex. pet containment, boundary definition, aesthetic enhancement, safety and security)? Talk to us. We can also give you a more reliable estimate at this time. Second, we come to measure and discuss the design options.. In some cases you may not even need to coordinate your schedule. If you know the design you want and we can access the project site we can measure the next time we’re in the area. If you’re unsure about what design fits your style, we recommend meeting in person. It’s up to you. We want to make it easy for you. We’ll provide a Guaranteed Price Quote. Third, if you like our proposal and want to get the ball rolling, just let us know. We’ll take care of the rest. We’ll even help with your Home Owners Association (HOA) if approval is required. Please let us know if you do need approval from an HOA. We’ll take care of the communication, details, and approval as much as permitted. HOA’s contracted to a management company usually don’t permit third parties to submit drawings on behalf of the homeowner. We can provide the necessary documents, drawings, etc. But, the email or letter has to come from you. Self-governed HOA’s are usually more permitting. In which case, the process may be entirely seamless to you. Then we build and install your project. That's it. Sit back and enjoy. Does Mind's Eye Fabrication do metal fabrication for projects other than wrought iron rails, fences, & gates? built trellis's, vehicle roof racks, aluminum trade show display, steel cages and equipment racks for landscaping trailers.